Over the years, I have been good, bad and somewhere in between when it comes to getting timely blog postings out. This year must have been the absolute worst. For those few readers out there who have not completely abandoned me, I do apologize. For those who have gone, what can I say? I have spent way too much time analyzing what went wrong this year that caused such a writing block to occur. I am not so sure that it was as much a writing block as it was the perception of not having time to do the work. I intend to employ some tools starting just as soon as I get this article posted that should help me in the time management area. I have never been a great note keeper. Over the years, I have tried very unsuccessfully to keep journals. I have about half a dozen partially filled journals adorning my bookcase that have served nearly no good whatsoever. One of my problems with keeping a journal is that I tend to be a neatness freak when it comes to handwriting. Therefore, the process of my handwriting anything is a very slow and laborious process. I am not sure how I made it through the Navy’s Nuclear Power Training Program with this particularly annoying trait, but I did. Anyway, as I have tried to journal on the go in the past I have found that it just takes too much time. I have made several attempts to do the journaling at the end of the day, but that too has never caught on as I tend to plant myself in front of the television to unwind from whatever adventure I lived through. If you add a glass or two of wine or a couple of beers to that setting, then there is no way that someone who must be able to read what he writes will ever be satisfied with the results. Lately, I have discovered some digital tools that I have been carrying around with me for a few years now that allow me to either dictate via my phone or to manually type into in short bursts as things happen. Then it is a simple matter of exporting those thoughts to a fresh document and adding the details and photos. So, no promises here, because I will still have to find time to sit in front of the computer and put words to paper, but I think I may be on to something. So, let’s talk about The Summer of 2016. I started to write an article early in the summer, but I found that my writing was leaning way too far towards the negative things we were witnessing and hearing about within Yellowstone National Park. Since I have always tried to keep this blog positive while acknowledging that not all that we experience is of a positive nature, the direction my article was heading just seemed way too far the other way. As we have all witnessed during what has been a year of endless negative campaigning, I didn’t want to add any further negative thoughts to the mix. Therefore, I abandoned that early draft and unintentionally set myself up for a summer away from writing. Over this past winter, we learned that former campground hosts who had been scheduled to work at the Mammoth Campground would not be returning due to health issues. We nominated a couple we are very close to who seemed a perfect fit for the position. They were interviewed and accepted the job. Then just several weeks before their scheduled departure date from the eastern part of the country the family suffered a significant and long-legged family emergency that forced them to cancel. By then it was late in the winter for the ranger to be able to find a couple that was not already committed somewhere else. However, Ranger Allan Bush was successful in his search and was able to fill all the positions. However, one couple could not arrive in the park in early May as is the normal practice. So, I volunteered Connie and me to get there early to fill the position until the third couple arrived. That meant that we would have to make a beeline to the park with only very brief stops in Greeley, CO, and Sheridan, WY, to visit my sister and brother and their families. 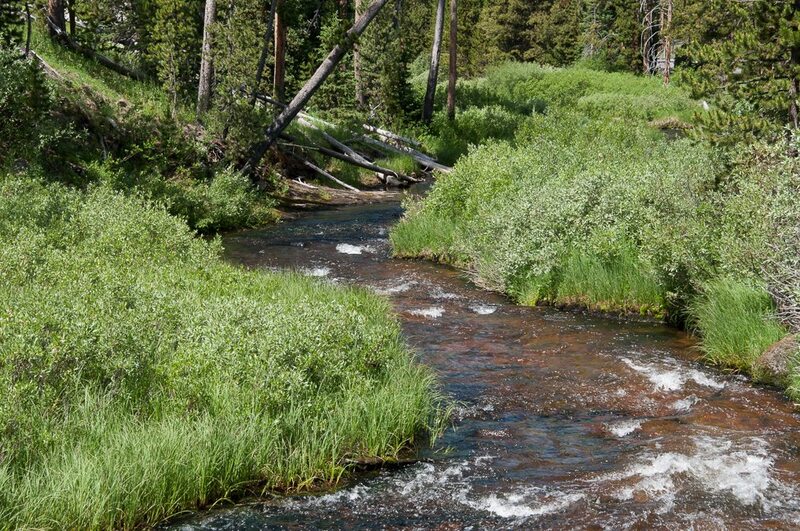 We left Kyle on May 4 and arrived at Mammoth Campground on May 8 to start work on May 9. It was a sprint for sure. When we arrived at Mammoth we learned that we would be responsible for training two of the three couples who would work the summer. We were okay with that, as we felt that we could help the new couples understand the relationship between the two campgrounds managed by Ranger Bush since we work at both. However, it wasn’t as easy as we had hoped. The first couple had arrived the day before we and were ready to learn. We got them up and running and then we remained in the campground as they worked their first rotation making us available to provide any necessary assistance. For us to train the second couple, we had to move out of the campground so they would have a place to park. So, the day before the third couple was to arrive we moved a few miles up the road to a government housing area that has several RV sites for seasonal employees. We then commuted back to the campground on the days we were to train the new folks. There is a lot of information that needs to be imparted on new host couples. Over time each couple figures out how to divide the workload to be their most efficient, but if they don’t both see all facets of the job they have difficulty understanding what each other is doing. With only two days to train, and not being resident in the campground after hours to answer any questions, we were swimming upstream for sure, to say nothing about the folks we were training. In the end, it all worked out and all got along quite well. A side note. One of those two couples had to leave very early in the summer due to a significant illness of one of them. That meant the other two couples had to work a much more stressing rotation. All the hosts from Indian Creek worked to fill in days a few times to give the Mammoth hosts a bit of a break. The way that worked was we would work during the day at Mammoth on one of our scheduled off days and the scheduled couple at Mammoth would relieve us late in the afternoon. That system worked well for all, but it did add to the stress a bit. By the way, the couple who had to leave early will likely return in 2017. Both seem to be doing quite well while not quite at 100% as I write this. As we completed our training duties in Mammoth, our good friends and co-workers at Indian Creek Campground, Rick and Donna Dumar, rolled into the park and we started spending quality time with them touring the park, exploring all our old dining haunts, and catching up. On one such day that we were touring the park, Connie received a call from a friend of ours at Visitor Services asking that we go to Norris Campground and spend two days working with the two couples who were camp hosting there. 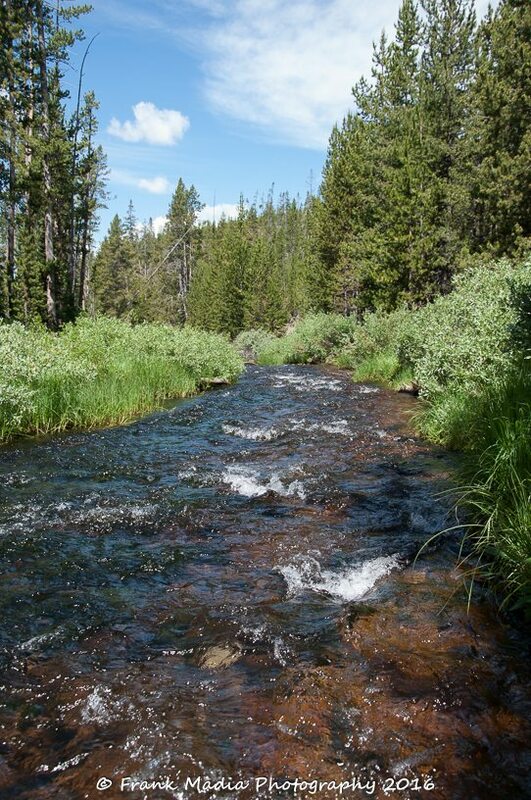 Over the winter there had been a mandate from the park superintendent that all Park Service managed campgrounds were to be managed the way Mammoth and Indian Creek Campgrounds are managed. Norris campground is the largest of the Park Service managed campgrounds and here-to-fore had a completely different management approach. Late in the spring Ranger Bush spent some time with the supervising ranger from the Canyon District to help him get started on the path to complying with the superintendent’s mandate. On opening day at Norris Campground, Ranger Bush and our friend from Visitor Services were at the campground helping them get going on the right foot. It was a few days later that we were asked to help. As it turned out when Connie got the call, we were only 15 miles from Norris, so we stopped in to see what the situation was and plan our strategy for the next two days. There were several concerns. I will spare you the details. Suffice it to say that our next two days were very busy and very stressful. This resulted in a marked improvement in the management of the campground and in the experience for the visitors seeking a campsite over previous years and that resulted in less stressed out visitors making their way to our campground upon finding Norris full. I could write a book about this, but I won’t. On our drive back to Mammoth following our second day at Norris, we came upon a broken-down vehicle that was partially blocking traffic. As it is our habit, we stopped and asked if assistance was needed, had any been called for and just what the problem might be. I share this, not because of the break-down, but because after calling the situation into dispatch we waited at the scene to make sure oncoming traffic slowed enough to avoid an accident. When the responding law enforcement rangers arrived, we turned over the scene to them and were just about to get on our way when one of the two rangers approached me and said, “Excuse me, commander, when did you retire?” Since I had never seen this seasonal ranger before, I was taken aback. As it turned out, he deciphered my license plate (CDR-RET) and made the link to my being a retired commander. He was a retired Senior Chief Petty Officer from the intelligence community. Over the summer, we would get to see a lot of this ranger and he and I shared more than a few sea stories from very different parts of the same Navy. Some of the lowlights of the early season received a lot of attention across the country and around the world. In case you were living in a dome of silence from say April to June, I will touch on a few of these incidents. There are several links to various websites below. I apologize in advance for the advertising that accompanies the articles. I do not endorse any of the advertisers. The second incident occurred just before we arrived in the park and it too went viral. A gentleman from Canada and his adult son came upon a bison calf who was in some sort of distress because it had apparently been separated from the herd. They captured the young animal and put it in the back of their SUV and took it to the nearest ranger station and asked or demanded that rangers take action to protect the creature from the elements. While the exact details will never be known as to how the animal became separated, what the cause may have been or how long it had been since the separation and the arrival of these would-be do-gooders, the outcome was not good. I am sharing two articles on this incident without any further editorializing from me. You can make your own determination. I will only say that Yellowstone National Park is a natural place and natural things occur there daily. Most of those natural occurrences do not need our assistance. The third incident really boiled my blood for a good long while. A group of young men who had been touring the western states and visiting many of our national parks took a walk across the iconic Grand Prismatic Spring. While this action is absolutely unsafe, there is collateral damage that has to be taken into consideration. The area that was walked upon has mats of high-temperature bacteria. It is these bacteria that give the spring its rainbow of color. The mats are quite fragile and footprints will remain in them for generations. In the article linked below you will read a quote from one of the violators that they had become overzealous and that led to their disrespecting the environment. However, as the investigation into this incident proceeded it was learned that the same group had violated the law in several parks in the western states all to promote their clothing brand, High on Life. In my opinion that fact casts a dark shadow over the apologetic statement made by one of the group members. Apparently, the judge saw things the same way as I. Early in the fall, the first of the group appeared in court to plead guilty to the charges. He was given a steep fine, community service and a ban from all federal property for several years. Others in the group chose to plead not-guilty. Their trials will be held later. With all the evidence, I don’t see them faring well at all. By the way, these are federal charges and the trials will be held in federal court. These gentlemen are all Canadian citizens. Not good. You may be wondering why I am bringing up all this history from April through June. There are several reasons. First, I think it is important to make sure that anyone who plans to visit any of our national, state, regional, or city parks understands that there are inherent risks involved. While the National Park Service strives to make the risks known to all visitors via a variety of methods, their efforts do not reach all would-be visitors. I feel that while my blog does not have a viral readership, it can be effective in helping to spread the word. I would hope that my readers would heed the warnings offered here and those provided at park entrance stations and visitor centers, but would also share these cautions with friends and family members who may plan visits to our national treasures. As I mentioned above these incidents and other similar events that occurred early in the season set the agenda for what would be talked about all season long. While that seems positive on the surface, it really became a burden. Part of our job as campground hosts is to assist visitors in making their stay in the park a positive experience. Depending on the individual or group that can be an easy thing or quite daunting. At any rate, with the bad things that happened in the spring we were constantly retelling the stories and explaining why people should not do some of the things they had seen on YouTube or Facebook. After a while, it wears on your psyche. We also found that it was a bit harder for us to enjoy the park on our off time as all too often we were witness to people violating the park’s safety rules and felt we needed to step in and remind the visitor to stop the activity. In fact, it got to the point that we tended to spend more time outside the park so as to not be witness to the on-goings. I really struggled through the season. For those of you who know me well know I have little tolerance for, shall we say, stupid. In the case of most the visitors to the park, the actions while seeming stupid to knowledgeable people, are not driven by stupid people. Many very intelligent people have done some incredibly questionable things in their lives, not because of stupidity, but because of lack of knowledge or an understanding of the effects of the action. With that said, the reaction of some people to a reminder of the regulation or an introduction to the regulation is not at all what one would hope for. We had people argue with us all season long about how they were not too close to some animal or another and that in the case of the elk they would never hurt anyone. People would swear at us when we cautioned them about leaving bear attractants out at their campsites. By mid-summer, my patience had worn thin and I let more than one person who was approaching too close to cow elk with calves that their actions were not smart and they were putting themselves in harm’s way. My chosen words were not appreciated and I was subsequently and justifiably counseled. In my defense, I pointed out the fact that I was trying to protect the individual from potentially serious injury. The fact that the person failed to appreciate my attempt to prevent pain led to a verbal escalation. Over time I decided it was possibly best to let a few of them get stomped rather than raise my blood pressure and damage my reputation by calling them out for their actions. While this approach kept me out of trouble with park managers and with Connie, it didn’t do me much good for feeling better about what people were doing. Hence, we spent less time among the visitors which also meant we spent less time in areas where photography opportunities would surface. I have spent the last 1400 plus words discussing the negative aspects of our summer season. I think the same discussion can also help to explain why I have spent so little time in front of my computer talking about it. I have always tried to keep this blog focused on the positive. Each time I sat down and tried to write something during the summer, I was distressed by the direction the writing was going and either deleted what I had written or saved it for another day in hopes I could turn the negatives around. The result has been no blog posts since April. Now that all of that has been taken off my chest, let’s move on to the fun. While the photographic opportunities were not as frequent or abundant as I would prefer, I was able to make some respectable images to share. 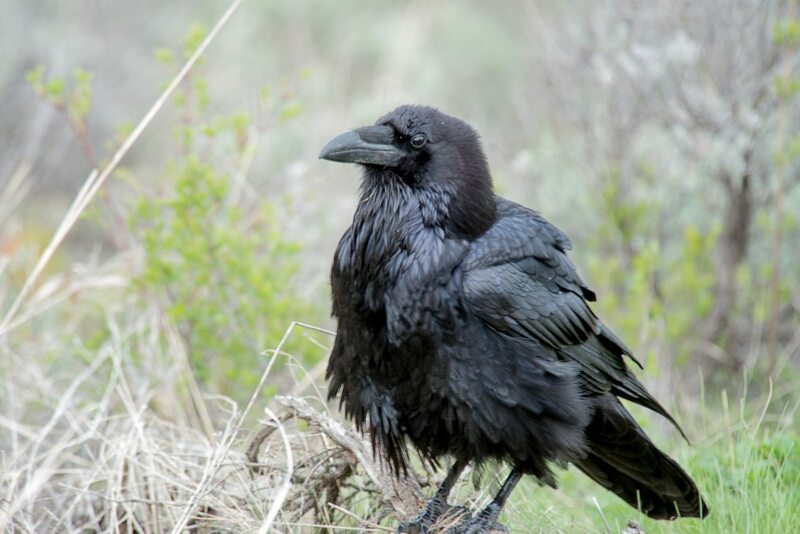 I have this thing for Ravens. I find them to be very intelligent and curious birds. This first image was made at the parking lot at Tower Junction early in the season. It was a cool and breezy day, so the feathers were being blown in all directions, but the bird was alert to all that was going on around it. 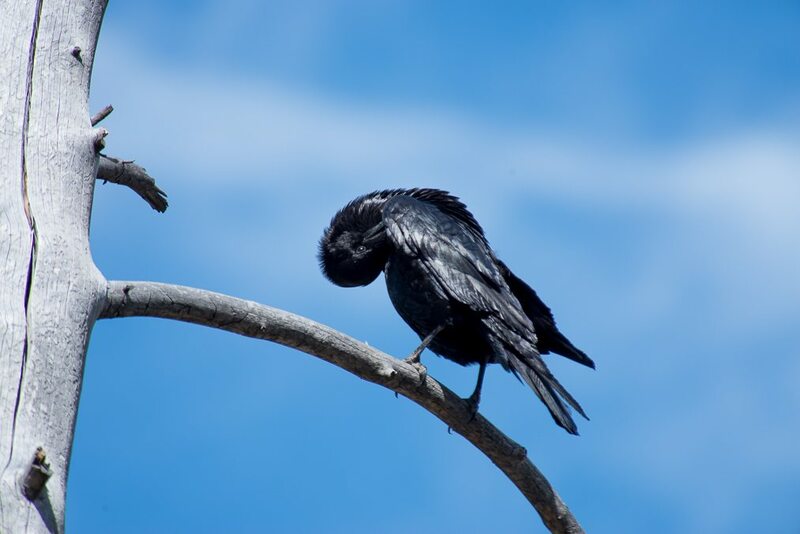 On our first drive into Yellowstone’s interior, we stopped at Tower Junction for a comfort break where a Raven was showing its stuff. I followed it around for a few minutes capturing a few images. This Raven was perched on a snag just below Gibbon Falls. Feather maintenance was the task of the moment. This bird gave me plenty of practice hand holding my long lens while trying to stay out of the way of the many visitors who wanted to see the falls. On a drive around the park, we stopped at Gibbon Falls where we found a cooperative chipmunk as well as the falls and a raven. Spring is always a good time to see a lot of animals in the park. Generally, there are not so many visitors so it is easier to get a good position to shoot from. In the case of this fox, Connie and I were driving along the Northeast Entrance Road when we spotted the fox headed towards the road. I pulled off the road and scrambled a few yards back to where the fox would soon approach. The fox was going about its business of hunting for lunch and paid little attention to me or the other two people who had stopped. 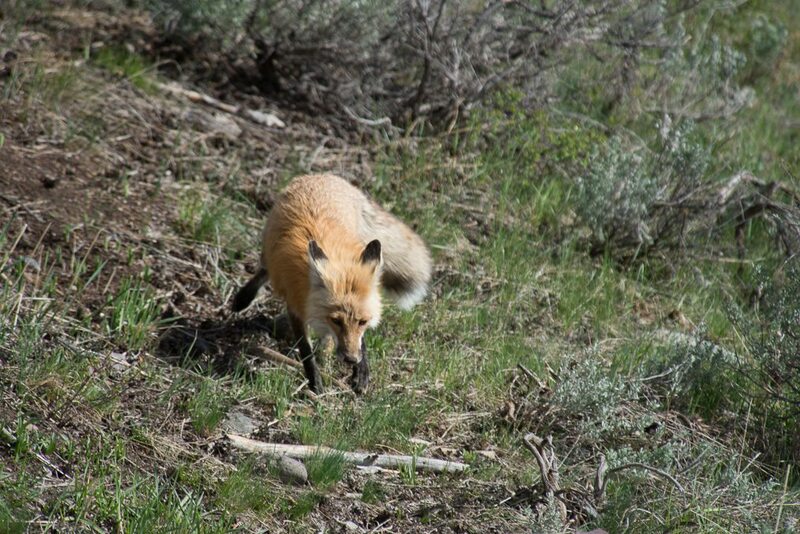 On our first drive into Yellowstone’s interior, we spotted a fox searching the roadside ditch for little critters to eat. I stopped at an authorized location and walked back to where the fox was. Unfortunately, a visitor stopped right alongside the animal and got it moving sooner than I would have liked. 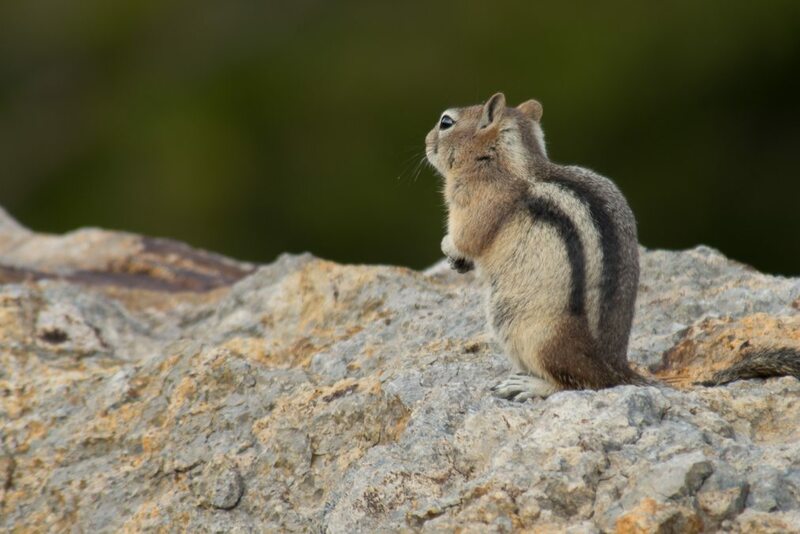 Back at Gibbon Falls, we saw this Chipmunk who was working the rock wall that separates the road from the path to the viewpoint. It was a busy little critter who got the attention of every child that passed by. I stood way back to get this shot with a long lens. At Gibbon Falls we found a cooperative chipmunk. 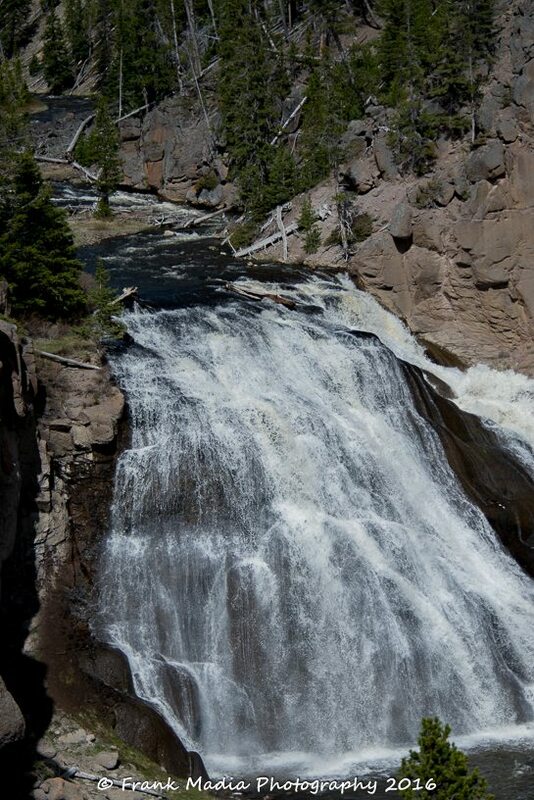 Of course, the reason one goes to Gibbon Falls is to see the falls. One of my favorite animals in the park is the Yellow-bellied Marmot. On a late afternoon in May, Connie and I stopped in at Sheepeater Cliff to use the restroom and found a small group of people watching this Marmot grazing on grass. This animal seemed to be habituated to humans which can be a double-edged sword. On the positive side, many of us there were able to make some incredible close-up images with a variety of lens lengths. On the downside, the animal kept moving closer and closer to humans showing no fear. 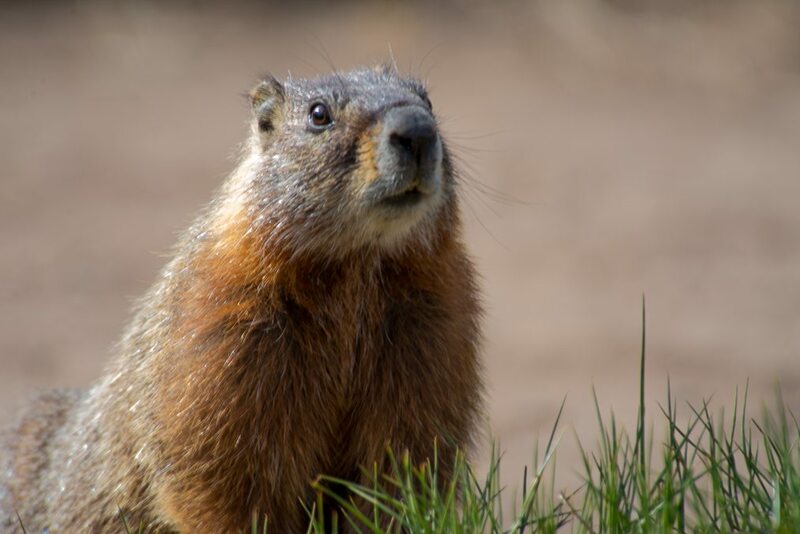 While I personally suspect it is unlikely that the Marmot had been fed by humans since their diet does not consist of anything we would eat, it is a bit of a wonder as to why it approached so closely. 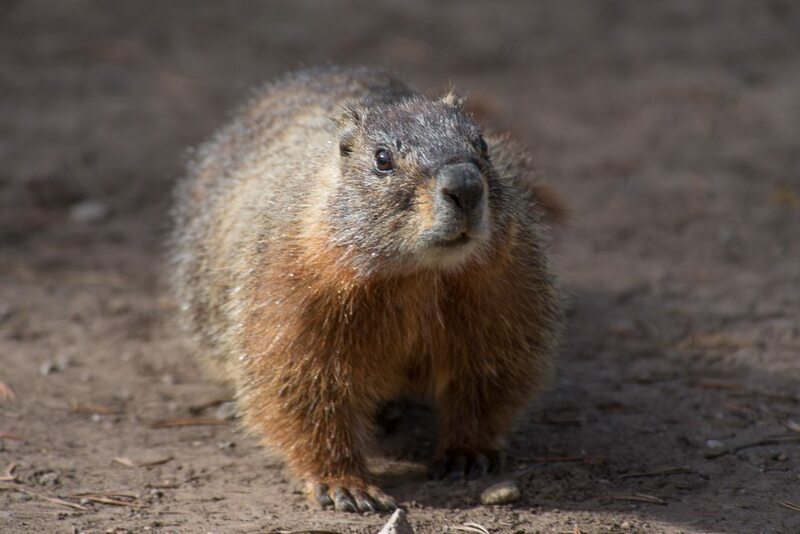 I have seen many Marmots in the park and most are very skittish when humans approach within several yards. This was my closest encounter and while I appreciated the opportunity for such wonderful photos, I worry about this animal’s future. Our last stop of the day was at Sheepeater Cliff to see what might be going on. We were rewarded for the effort by a very cooperative Yellow-bellied Marmot. She was really quite cute, don’t you think? If you follow my blog at all, you know I am most fond of bears. We had several sightings of bears in the spring and early summer. Most of the time the conditions were not good for making photographs. There was either no place to safely pull off the road, or just too many people making it a stressful time for the animals. 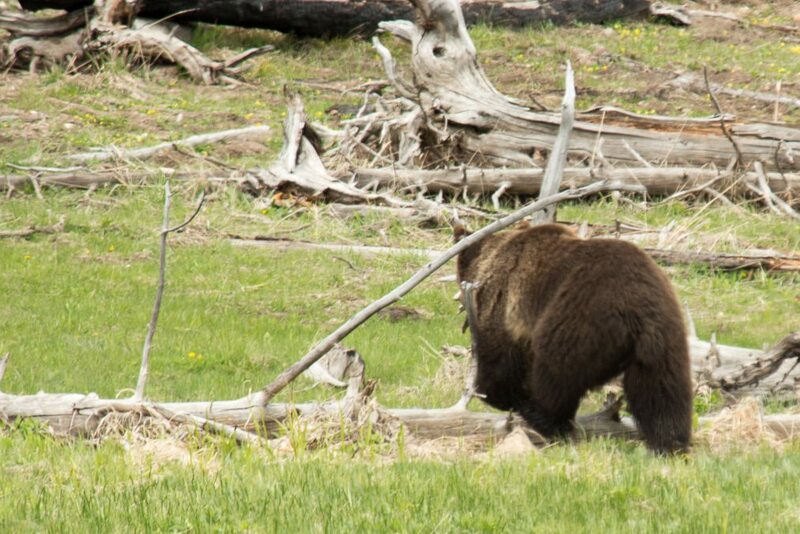 I got a reasonable shot of a grizzly as it walked away from the roadside and all the people admiring it. Grizzly Bear Walking Away From the Camera. I guess walking away is better than charging the photographer. Each spring Connie and I try to make a trip to LeHardy Rapids on the Yellowstone River to see the Harlequin Ducks. This spring was no exception. As has been the case for most of our early visits to this site we found a male and female duck resting on a rock in the middle of the river. 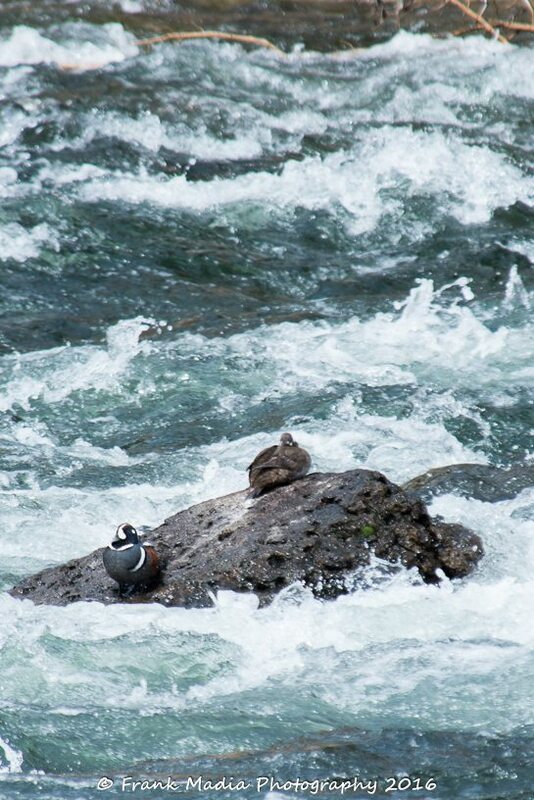 Harlequin Ducks at Le Hardy Rapids. Between Norris Junction and Canyon Junction, there is a road off to the south of the main road that goes to Virginia Cascades. There is a lot to see along this road, including some fantastic engineering that went into making the road bed. The cascades, which differ from falls in that the water doesn’t free fall off a cliff, nor does it make a typical set of rapids, instead it cascades across the rock at a steep angle. Hence the term cascade. I have never been very satisfied with my images of the cascade, but just a few hundred yards upstream of the cascade the Gibbon River meanders through a beautiful valley making for some very eye-pleasing images. While we were looking around and taking in the beauty of the area, another vehicle pulled in and the occupant got out a lawn chair and just sat down for what was likely a long afternoon of relaxing contemplation as he admired the natural beauty of this nearly secluded albeit accessible area. The colors were bold and fresh. It was a beautiful day and so very relaxing. 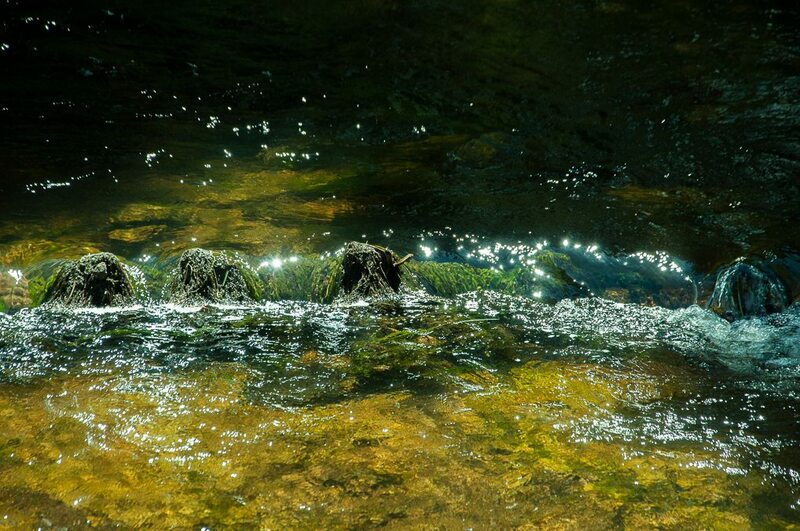 I found the sparkle of the sunlight on the water to be irresistible. Well, we have made it to July. I will say that by this time of the summer there had not been many additional reports of questionable conduct that would go viral. But, the summer was heating up and the park was getting dryer by the day. We would eventually experience the worst fire season since 1988 when thousands upon thousands of acres of the park would burn. Fortunately, the management plan that was put into effect following the 1988 fires seemed to be effective in minimizing the destruction this year. While this was the worst fire season since 1988 the fires were not nearly so catastrophic as they were three decades ago. I believe all the fires in the park this year were lightning started and all burned for weeks. All fires were monitored closely by park officials. Some required intervention to protect developed areas inside the park and, in the case of one that bordered West Yellowstone, Montana, several agencies were involved in keeping the fire out of town. Over the season hundreds if not thousands of firefighters from around the country were deployed to the park to help keep the fires under control or to be staged to prevent destruction in the developed areas. We certainly do appreciate the efforts of these brave men and women who put their safety and lives at risk to protect the environment we love so dearly. Smoke and haze made photography a challenge for most of the hot part of the summer. I did do some wildflower photography, but to be honest I have not done my homework to identify all of my flower images. So, none will be included in this writing. I will endeavor to post an article focusing on those images later in the winter. Indian Creek Campground where Connie and I live and work during the summer closes on the Monday after Labor Day each year. 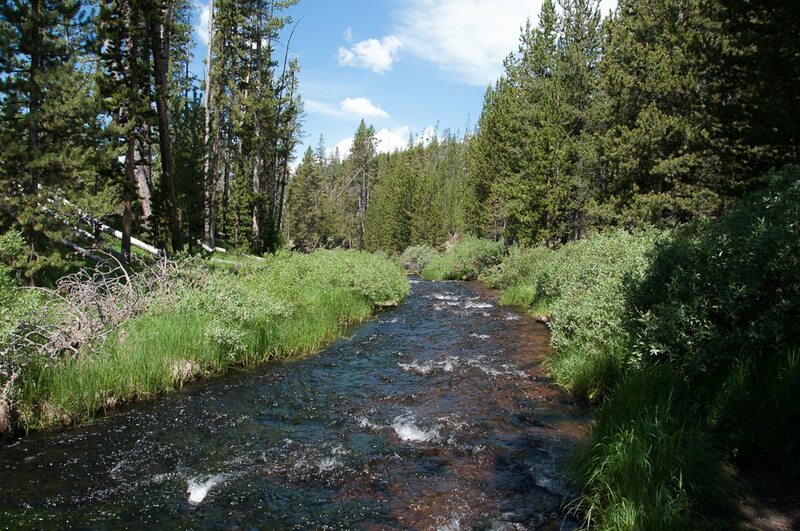 Historically, we then move to Mammoth Campground where we live and work until we leave for the season. 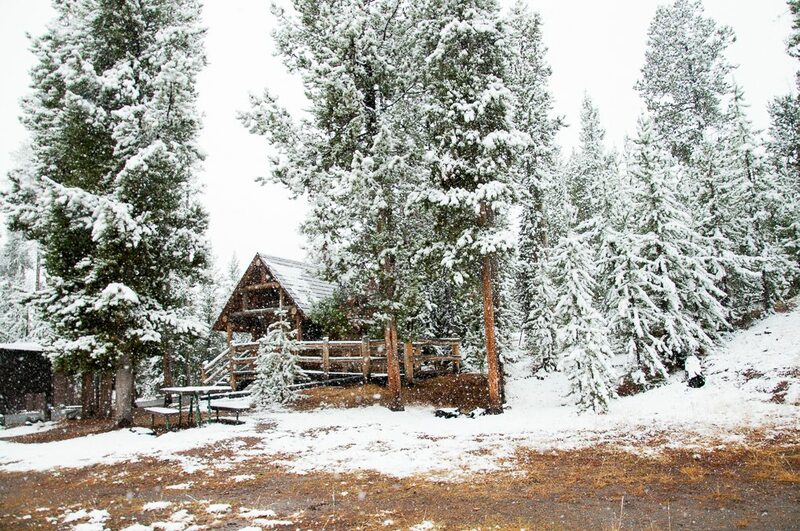 This year all three couples from Indian Creek Campground moved to Mammoth for the fall. It was fun having us all together for the full season. One of the many questions we get in the fall is why do all the campgrounds close so early. The campground opening and closing dates have evolved over the decades based on several factors such as staffing, both paid maintenance and law enforcement and volunteers. Weather is a huge factor as it can play a role on the workload of the available staffing. I share this as an introduction to the next images I made. All the images in this next group were made on this season’s closing day at Indian Creek Campground. While the snow probably looks inviting, the conditions were miserable. For several days prior to closing, we experienced hard freezes that jeopardized our water system. 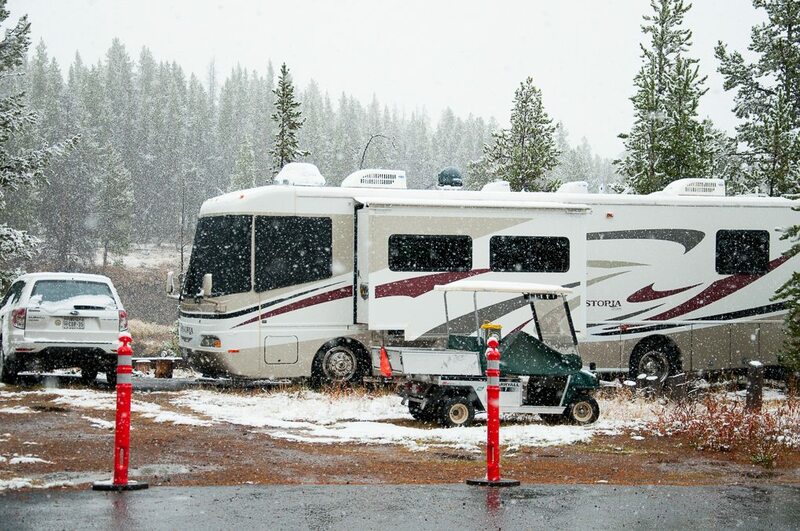 I have our motorhome and the water supply to it protected to somewhere in the mid to low 20s. However, without allowing water to flow through all the spigots around the campground we risk breaking pipes in the supply system. Once the campground is closed the water system is blown dry by park staff, the same staff that starts to disappear by mid-September. 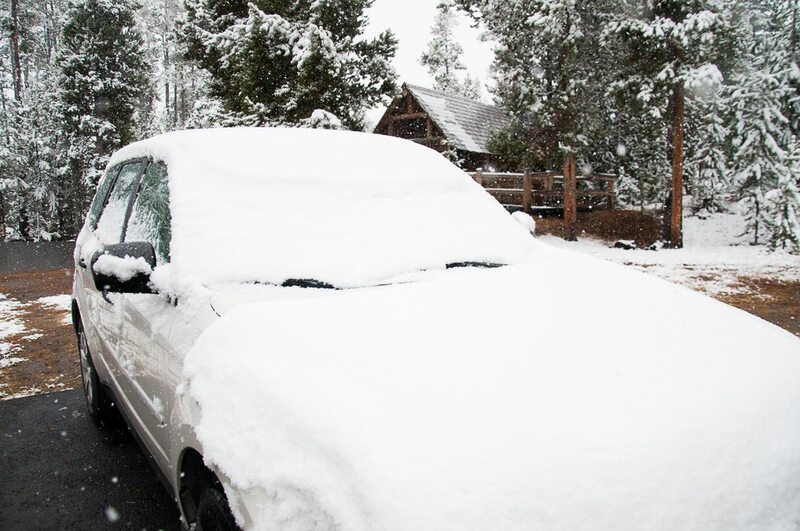 So, while the daytime temperatures in the Mammoth Hot Springs area can still reach into the high 70s this time of year, the nighttime temperatures in the low 20s in the higher elevation areas can cause maintenance nightmares. Enjoy these photographs, but keep the perspective that as inviting as the scene may be during a cold, wet, snowy day, it can turn quite dangerous once the sun goes down. The park managers have it right when it comes to when to close campgrounds. Our car covered in a very wet snow. The campground registration cabin. It really looks prettier with the snow than without. Our motorhome a mere 24 hours before we moved to Mammoth Campground and gained about 30 degrees. I am rapidly approaching 5000 words, so I think I will stop here to give anyone who is still reading this a break. In the next several days I will continue and hopefully get through our fall travel adventure. As usual, I thank you for staying with me on this adventure through life. I do sincerely apologize for the gap. As always, love reading about your adventures! I can only imagine how frustrating it was to see visitors put themselves or others in harms way. You have to wonder -what are they thinking? Good that there are folks like you & Connie to help save them from themselves! Love all the photos! Such a beautiful place! Thanks for sharing!! We hope to get back there someday soon! At last, Frank! I thought you had quit doing this, I know it is a chore sometimes. Totally share your thoughts and feelings about the idiots that think because it is a National Park, it belongs to them and can do what they wish. I was horrified to find out they were from Canada! They wouldn’t get away with that up there….. As for the geniuses that think they can pet the bison and elk, I say leave it to natural selection and get them out of the gene pool! I guess I am turning crabby as I get older, but like you, am tired of people trashing and disrespecting beautiful places. Seeing more and more of it in my travels. Loved your photos, especially the yellow bellied Marmot……so cute! Anxiously awaiting your next installment. Love your pictures, Frank! Really Love Them! I also agree with your anger against the irresponsible idiots that ruin it for all the good people. Hang ’em high! I have the same problem with keeping my tongue in the presence of overwhelming stupidity, and realizing that if the ignorant bugger gets stomped by the critter dejour I will feel far worse for having not interceded. Give em hell Frank! Hi Frank. I enjoyed your blog and chastise myself for not having made it to Yellowstone yet. It’s such a beautiful place and I can tell that you and Connie love it. It’s always hearing about your adventures. I could not of handled it any better than you did when you encounter these thoughtless, reckless people. Your service is greatly appreciated , but I can tell that it came at a great cost to your personal peace. As always, thanks for a good read. Frank for the summer you had you did a wonderful job on the writing. The tourist wrong doings were getting out of hand and had to be addressed. Very good use of your 5000 words. Wow Frank! I can’t believe the number of infractions that I read about or heard in the news regarding park visitors. I’m sorry we were not able to fulfill our obligation, but it sounds like great people came in and helped out! Thanks for the blog update. I always like reading the latest and seeing your pictures. My favorite one is of the sun glistening on the water. Great commentary, as usual. Keep writing when you can.